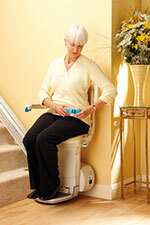 Own your own stairlift – Prices starting from just £1495 for a NEW fully-fitted stairlift including 12 months warranty! All new straight stairlifts from Westwood Stairlifts are carefully selected from the leading UK and European manufactures using the most up to date technology and safety features and all our engineers are manufacturer trained and approved to install and maintain them to the very highest standard. Our complete range of straight stairlifts goes from basic stairlifts through to superior models with many comfort options available. We also offer stand and perch seats, outdoor stairlifts and heavy duty mechanisms carrying upto 31 stone (200kg). We offer a stairlift rental scheme and can also supply reconditioned stairlifts – click here to find out more. "Highly recommend this company, no high pressure sales, prompt service, competitive prices and a highly skilled installation team."